"To appreciate the beauty of a snowflake it is necessary to stand out in the cold" wrote Aristotle. He said that back in ancient Greece (350 BC), where 30s was probably considered "cold". If only. Speaking of snowflakes, I don't expect any (new) frozen water in your yard looking out 7-10 days. It's a dry pattern, as large southern storms detour south/east of Minnesota. The snow cover map shows 4-6 inches on the ground over southern and far northern counties, but a lot of brown over central Minnesota. Until and unless we get just the right combination of southern moisture and Canadian chill, that won't change much. I still see us gliding into a somewhat milder pattern, as prevailing winds blow rather consistently from the Pacific, instead of the Arctic. 20s over the weekend give way to a string of 30s next week; a little snow melt each afternoon, as temperatures struggle above freezing. Expect a slow-motion meltdown next week. Historical data shows a 75 percent chance of a white Christmas (1 inch or more on the ground) in the Twin Cities. At this rate it may be touch and go this year. Graphic credit: Minnesota State Climatology Office - DNR Waters. Odd Snow Cover Pattern. Here's a snippet from this week's edition of Minnesota WeatherTalk from Dr. Mark Seeley: "...Much of the snow remains on the ground as temperature have generally stayed below the freezing mark around the state all week. Over 25 climate stations reported subzero overnight temperatures this week, led by -15°F at Warren (Marshall County). Also noteworthy is the fact that the weekly snow depth map from the Minnesota State Climatology Office shows an unusual pattern for Minnesota with both the northern and southern counties showing snow depths of 4-6 inches, while the middle part of the state shows less than 2 inches or no snow cover at all..."
10-Day Snowfall Outlook. The map above shows total snow accumulation 240 hours into the future, based on ECMWF. Parts of the Carolinasmay get socked with some 1-2 foot amounts, but snowfall is forecast to be spotty and sparse everywhere else into the end of next week. Map: WeatherBell. Colder Surge Before Christmas? This far out confidence levels are lower than usual (they're usually low, by the way) but NOAA's GFS forecast for 500mb winds out roughly 2 weeks shows a deep longwave trough of low pressure, potentially capable of generating a significant storm over the central USA. I still see hints of an emerging El Nino signal in the longer-range model guidance. A system that is moving over the Desert Southwest today will help produce snow and freezing rain across the Southern Plains and the Southeastern United States through early next week as it pushes east. This winter storm will bring snow and ice across parts of the Texas Panhandle and Oklahoma today into Saturday, with up to 5” of snow and a tenth of an inch of ice possible in locations. 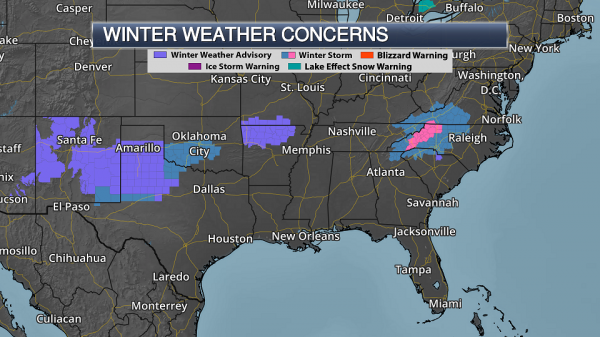 Amarillo and Lubbock remain under Winter Weather Advisories, with Oklahoma City under a Winter Storm Watch. The storm will continue eastward this weekend, bringing rain and freezing rain to the Mid-Atlantic Saturday. That precipitation will change over to snow across western North Carolina and southern Virginia into Sunday, with over a foot of snow possible for parts of the southern Appalachians and Blue Ridge. Southern Winter Storm. We are continuing to track a winter storm which will bring ice and snow impacts across the Southern United States to the Mid-Atlantic through the weekend. For areas of the Southern Plains, frozen precipitation in the form of freezing rain and snow will become more widespread from eastern New Mexico into the Texas Panhandle and Oklahoma tonight into Saturday morning. Some wintry precipitation will also be possible tonight into Saturday across southern Missouri and northern Arkansas. Further east into the Mid-Atlantic, precipitation will start out as rain and freezing rain Saturday, changing over to snow by Sunday. The heaviest snow is expected across parts of western North Carolina, with over a foot possible by the time precipitation winds down early next week. Amarillo, TX: Winter Weather Advisory until Noon Saturday for snow of 1-3" and a light glaze of ice. Lubbock, TX: Winter Weather Advisory from 6 PM tonight until Noon Saturday for 1-4" of snow. Oklahoma City, OK: Winter Storm Watch from 9 PM tonight through Midnight Saturday Night for 2-4" of snow and up to 0.1-0.2" of an inch of ice. Branson, MO: Winter Weather Advisory from 6 AM Saturday to 6 AM Sunday for 1-3" of snow. Asheville, NC: Winter Storm Warning from 7 PM Saturday to Noon Monday for 10-16" of snow and up to 0.1" of ice. Charlotte, NC: Winter Storm Watch from 7 PM Saturday to Noon Monday for 3-11" of snow and a glaze of ice. 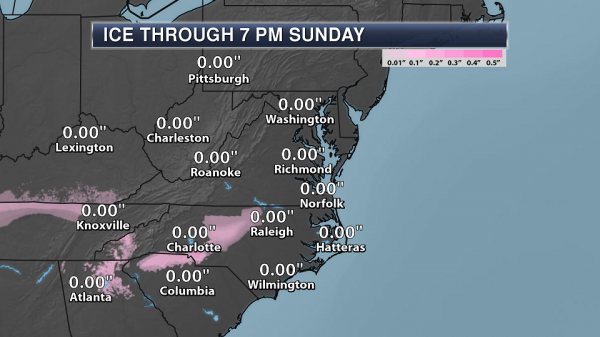 Greensboro, NC: Winter Storm Watch from 1 AM Sunday to 7 PM Monday for 6-10" of snow and up to 0.1" of ice. Roanoke, VA: Winter Storm Watch from Midnight Saturday Night to 11 AM Monday for 5-13" of snow. 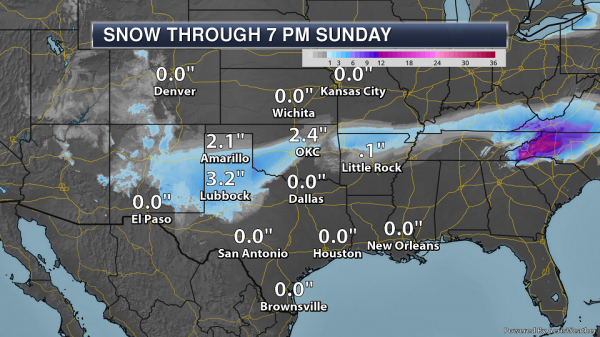 Southern Plains Snow Forecast. Across the Southern Plains, a band of 2-5" of snow is expected to fall from eastern New Mexico into central Oklahoma, with a secondary band of 2-4" amounts across northern Arkansas and southern Missouri. Most of the snow across the region will fall tonight into Saturday as temperatures cool down enough to turn precipitation over to snow. Southern Plains Ice Forecast. 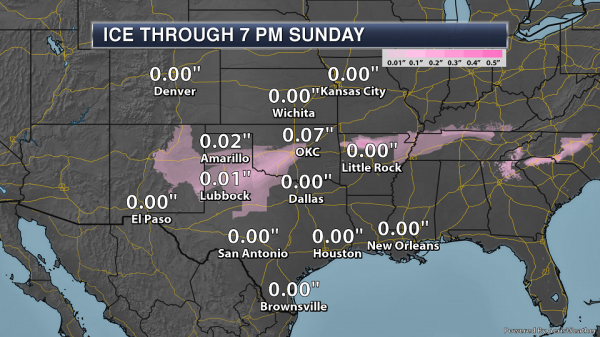 Up to a tenth of an inch of ice is possible across parts of the Texas Panhandle to Oklahoma today into early Saturday. Even though these ice totals have been decreased, this amount of ice could still cause slick roads and some power outages across the region. The heaviest ice - potentially up to a quarter inch - is possible across parts of northern Arkansas, mainly between Harrison and Clinton. Mid-Atlantic Snow Forecast. 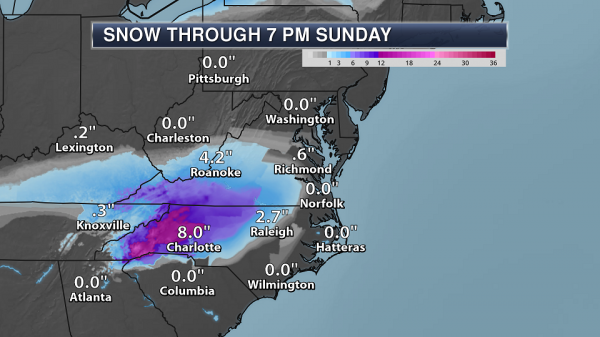 Snow will be the main story across parts of the Carolinas and into Virginia with this winter storm, as some areas of the southern Appalachians and the Blue Ridge could receive over a foot of snow through Sunday evening. This snow will last into Monday across the region. Mid-Atlantic Ice Forecast. Some freezing rain and ice - mainly up to 0.1" - is possible across parts of northern Tennessee and from northeastern Georgia into central North Carolina. Heavy Rain Likely. 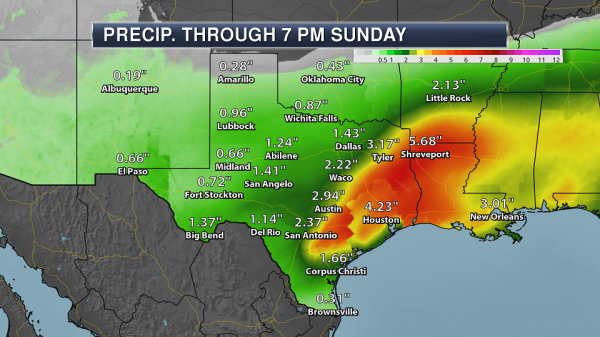 Another threat to watch across the Southern Plains is heavy rain and flooding. This storm will produce heavy rain on the order of at least 2-6" for areas like San Antonio, Austin, Houston, Shreveport, and Lake Charles. This heavy rain will lead to the potential of flash flooding. Flood Watches. 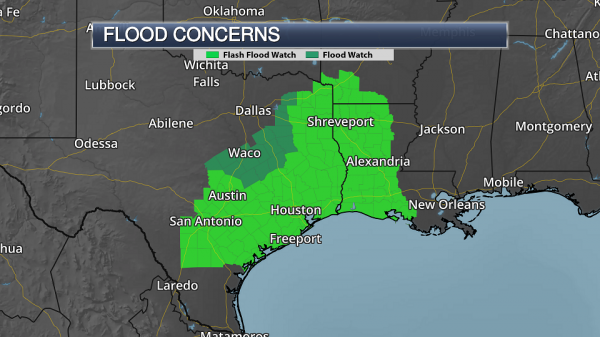 Due to the heavy rain threat, Flood Watches and Flash Flood Watches have been issued across parts of eastern Texas, western Louisiana, and southern Arkansas. 150 Minutes of Hell. The San Francisco Chronicle describes, in vivid (horrifying) detail, what it was like trying to contain the Camp Fire in northern California. Here's an excerpt: "...Death was stalking each of them. Over 150 hellish minutes, they would claw for survival. Some would forge narrow escapes. Some would become heroes. Several wouldn’t live through the night. Andrews had little choice but to hunker down. He gripped the dozer’s protective foil curtains closed with his left hand to keep the wind from batting them open. With his right hand, he pulled his shirt over his nose and mouth. The heat seared his throat. This was how most firefighters died, he knew. Not from flames, but their own bodies roasting. Temperatures within the tornado soared to 2,700 degrees, flames blasting into the sky. A nearby Cal Fire truck exploded. Andrews dialed 911. His singed hands trembled. A dispatcher answered, on the verge of tears. Dozens of others had phoned in already describing the unfolding hell. Now, here was a call from ground zero..."
U.S. Coal Consumption Falls to Lowest Level Since 1970s. Take a bow, natural gas and renewables. The Houston Chronicle has the story: "The last time the United States consumed so little coal, Jimmy Carter was president and the Arab oil embargo was still fresh in motorists' minds. 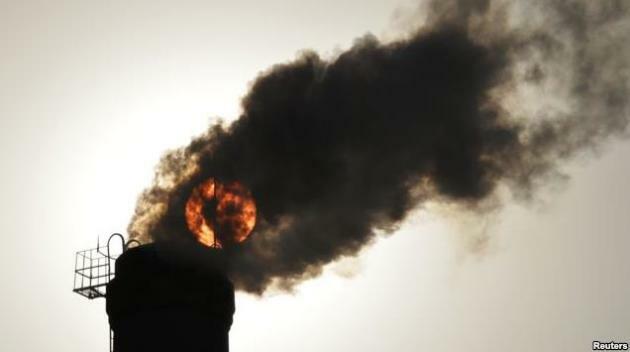 According to a report from the U.S. Energy Information Administration, the United States will likely burn through 691 million short tons of coal this year, the lowest level since 1979 and a 39 percent drop from coal's 2007 peak. The power sector accounts for more than 90 percent of the country's coal consumption, and coal's more than decadelong decline is "the result of both the retirements of coal-fired power plants and the decreases in the capacity factors, or utilization, of coal plants," the report reads..."
Xcel is First Big Utility to Swear Off Greenhouse Gas. Bloomberg has more perspective on the recent announcement to be carbon-neutral by 2050: "...Xcel did not pledge to quit fossil fuels. The company would consider using systems designed to capture and trap carbon dioxide emissions from gas or coal plants. “All technologies must be on the table,” said Lisa Kiava, a company spokeswoman. “We are willing to explore all of them, including ones that are not yet cost effective.” Xcel’s push comes as wind and solar energy have become cheap enough to compete with conventional forms of electricity generation. Other utilities have goals to reduce carbon emissions by as much as 80 percent. But Xcel’s goal is the most ambitious to date, according to Bloomberg NEF analyst Colleen Regan..."
Photo credit: Carla Gottgens, Bloomberg. 3M: Every New Product Must Reach a Sustainability Goal. Star Tribune reports: "Most companies have a general sustainability goal. However, 3M Co. is upping its green game by requiring every new product to have a sustainability component. That means designers and those who make the products must develop a goal on how the products or 3M factories producing them reduce waste, energy, water or material usage — or how the products can help customers achieve those reductions. The effort, announced at the United Nations Climate Change Conference in Poland early Wednesday, is expected to touch each of the roughly 1,000 new products 3M introduces each year..."
Photo credit: Glen Stubbe - Star Tribune file. "3M has increased its sustainability commitment. Pictured is its global headquarters in Maplewood." Inside North Korea's Hacker Army. Bloomberg Businessweek has an eye-opening report; here's an excerpt: "...North Korea’s hacking prowess is almost as feared globally as its nuclear arsenal. 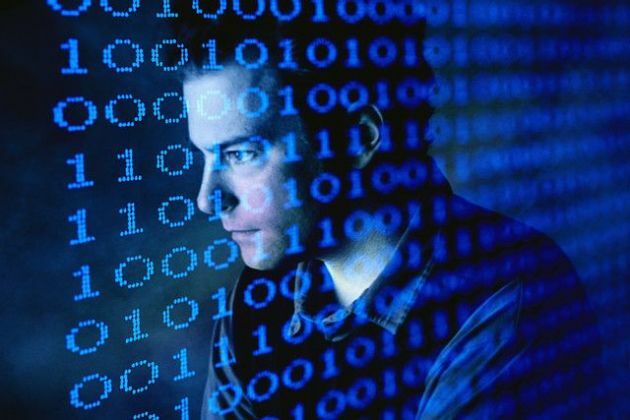 Last May the country was responsible for an internet scourge called WannaCry, which for a few days infected and encrypted computers around the world, demanding that organizations pay ransom in Bitcoin to unlock their data. A few years before that, North Korea stole and published the private correspondence of executives at Sony Pictures Entertainment, which had produced a Seth Rogen satire of the country called The Interview. Jong wasn’t involved in those attacks, but for half a decade before defecting, he was a foot soldier in North Korea’s hacker army. 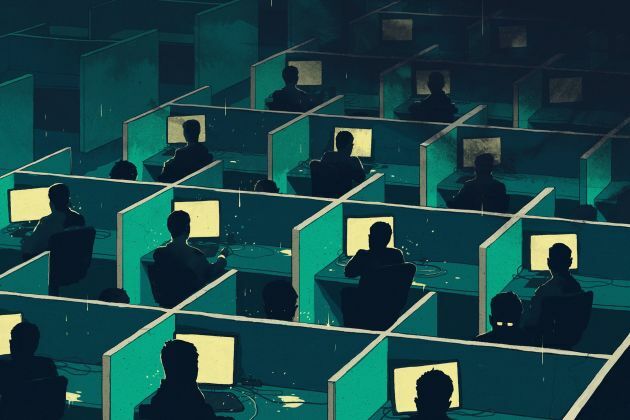 Unlike their counterparts elsewhere, who might seek to expose security vulnerabilities, steal corporate and state secrets, or simply sow chaos, North Korean hackers have a singular purpose: to earn money for the country, currently squeezed by harsh international sanctions for its rogue nuclear program..."
Illustration credit: Simon Prades for Bloomberg Businessweek. Millennials Didn't Kill the Economy. The Economy Killed Millennials. A story at The Atlantic caught my eye; here's a snippet: "...The 80 million–plus people born in the United States between the early 1980s and the late 1990s stand accused of assassinating various hallmarks of modern life. The list of the deceased includes golf, department stores, the McDonald’s McWrap, and canned tuna. Millennials tore up napkins, threw out mayonnaise, and mercifully disposed of divorce and Applebee’s before graduating to somewhat postmodern crimes: “Have Millennials Killed Serendipity?” With the national murder rate in long-term decline, it may even be said that Millennials are killing killing. But according to a new report by economists at the Federal Reserve, this genre of news analysis is pure fiction..."
Photo credit: "A Millennial shops at a used-clothing store." Robert Galbraith / Reuters. Big Tech Has Your Kid's Data - And You Probably Gave It To Them. Again, if the service is "free" - you (and your data/habits/preferences) are the product, as a story at Vox reminded me: "...A recent study focusing on the “datafication” of children and its possible consequences suggests these posts may be more problematic than we think. In late November, Anne Longfield, England’s children’s commissioner — tasked with promoting and protecting the rights of children — published a report titled “Who Knows What About Me,” which examines how big tech collects data on children and what the potential dangers can be. In the report, Longfield argues that parents are exposing their children’s data at an alarming rate. The report calculates that by the time a kid turns 18, there will be 70,000 posts about them on the internet. The report calls on parents and schools to examine the type of gadgets children play with, like smart speakers, wifi-powered toys, and gaming apps, all of which are collecting data on kids..."
Facebook Secretly Shared User Data After Saying It Stopped. Why am I not surprised. Here's a clip from The Daily Beast: "Facebook secretly gave user data to companies including Netflix, Lyft, and AirBnb after claiming it had limited such data sharing, newly released documents show. Facebook CEO Mark Zuckerberg also discussed how to profit off sharing users’ data. On Wednesday, Britain’s Parliament released 250 pages of documents that included internal Facebook discussions on data-sharing. The documents show Facebook gave apps broad access to data about users’ friends after 2014, when it publicly ended the practice. “If people don’t feel comfortable using Facebook and specifically logging in Facebook and using Facebook in apps, we don’t have a platform, we don’t have developers,” a Facebook spokesperson said of the policy change at the time..."
More Parents are Naming Their Babies After Healthy Foods. God help us. Quartz has the details: "...This year’s findings suggest that parents are increasingly inspired by the wellness movement. Names related to spiritual practices like yoga or meditation, like Peace, Harmony, or Hope, have risen in popularity, and so have names tied to healthy food trends. Say hello to the age of Baby Kale. “As fast food and processed snacks lose ground to clean eating and Paleo diets, more Gen Z and Millennial parents are choosing baby names that reflect their love of healthy foods,” BabyCenter explains in its press release. For girls, parents are increasingly picking names like Kale, Kiwi, Maple, Hazel, Clementine, Sage, Saffron, and Rosemary. Names like Saffron, Sage, and Hazel are also on the rise for boys..."
Smello-Vision is Coming to a Theater Near You. Star Tribune has the mouthwatering details: "With a new campaign for its Pillsbury refrigerated-dough products during the holidays, General Mills will give commercials in movie theaters an extra touch by pumping that alluring scent as cinnamon rolls appear on screen. Of the nearly 200 theaters where the commercials will air, about 25 will get the smelly kick, including seven in Minnesota. “Think of it as a great, big air freshener,” General Mills spokeswoman Tammy Swanson said. “It pumps on low during the commercial and then turns off afterward so the smell dissipates.” The campaign, which started Nov. 23, marks the first time General Mills has employed scent machines in theaters to sell a product. The machines will have to be turned on and off manually and quickly — the commercials last just 15 seconds..."
Dubai Launches Sail-Thru Supermarket for Yacht Owners. Taking wretched excess to an entirely new level. CNN Travel explains: "Behold, what is claimed as the world's first "sail-thru supermarket" -- a floating retail emporium ready to cater to anyone unwilling to leave the comfort of their yacht when picking up the groceries. The purpose-built ship, anchored out at sea, is the work of Dubai-based shopping mall Majid Al Futtaim. Customers have the choice of more than 300 snacks and treats from the vessel, which is a franchise of French retail giant Carrefour. Anyone passing by on a yacht or Jet Ski, can order and collect at the boat's window counter -- or order via app or phone call..."
27 F. high yesterday in the Twin Cities. 30 F. average high on December 7. 21 F. high on December 7, 2017. December 8, 1995: A strong low pressure system passes across Northern Minnesota, producing considerable snowfall in advance of an intense cold front. Snowfall of five to eight inches was common with eight inches recorded at New London and Alexandria. The most snow reported was 9.6 inches in Mound. The Minneapolis St. Paul International Airport received 7.1 inches. The cold front moved through by late morning on the 8th as temperatures dropped 20 degrees within an hour of the frontal passage. Strong northwest winds of 20 to 40 mph immediately behind the front resulted in severe blowing and drifting and white-out conditions in many areas. Over 150 schools closed early or cancelled classes. Many businesses closed early as well. The Governor ordered state offices closed at noon on the 8th, sending thousands of state employees home. Over 100 outbound flights were cancelled at the Twin Cities International Airport, but the airport remained open. December 8, 1804: John Sayer at the Snake River Fir Trading Post near present day Pine City mentions: 'Cold day. Thermometer 10 degrees below freezing.' Lewis and Clark also noted this cold wave at their winter quarters in Ft. Mandan, North Dakota near present day Bismarck. What's the Difference Between Global Warming and Climage Change? NOAA's climate.gov division has a good explainer; here's an excerpt: "...Today’s global warming is overwhelmingly due to the increase in heat-trapping gases that humans are adding to the atmosphere by burning fossil fuels. In fact, over the last five decades, natural factors (solar forcing and volcanoes) would actually have led to a slight cooling of Earth’s surface temperature. Global warming is also different from past warming in its rate. The current increase in global average temperature appears to be occurring much faster than at any point since modern civilization and agriculture developed in the past 11,000 years or so—and probably faster than any interglacial warm periods over the last million years..."
Image credit: "Temperatures over most of the past 2000 years compared to the 1961-1990 average, based on proxy data (tree rings, ice cores, corals) and modern thermometer-based data. 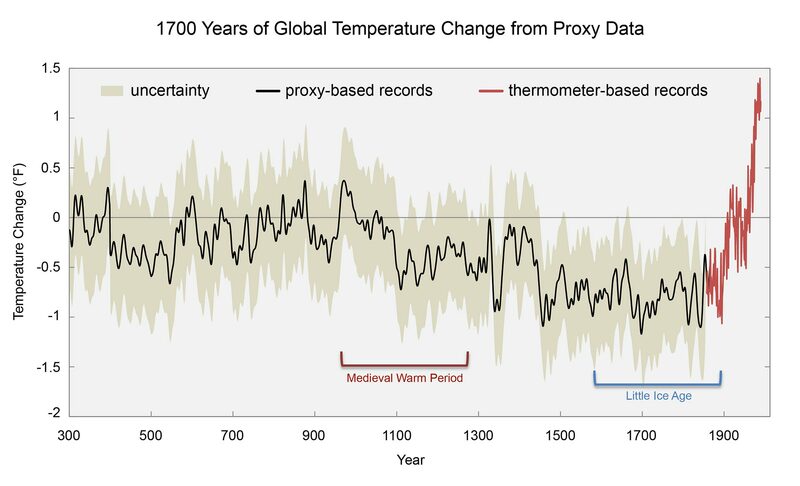 Over the past two millenia, climate warmed and cooled, but no previous warming episodes appear to have been as large and abrupt as recent global warming." NOAA Climate.gov graph by Fiona Martin, adapted from Figure 34.5 in the National Climate Assessment, based on data from Mann et al., 2008. The Truth About These Climate Change Numbers. Jeff Goodell has a sobering update at RollingStone: "It's often argued that climate change is not a technological or engineering problem, it is a political problem. And it’s true. We have all the technology we need to power the world with renewables and stave off the worst of climate chaos. What we lack is the political will to take the kind of moonshot-scale action necessary to accomplish it. But climate change is also a numbers problem. Every ton of carbon that we dump into the atmosphere stays there for hundreds of years, warming the atmosphere and reshaping the future climate. As the recent IPCC report pointed out, to avoid the worst of climate chaos, the world needs to reduce carbon emissions to zero by 2050. Accomplishing that would require not just a remaking of our energy system, but profound changes in agriculture, the design of cities and transportation systems. 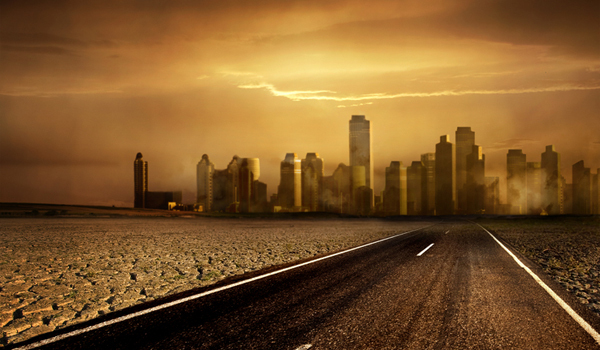 It is possible to imagine how a revolution like this might happen, but it’s even easier to imagine how it would not..."
Human-Induced Climate Change Makes Heat Waves 30 Times More Likely. At least in the UK, according to a post at CNN.com: "Human-induced climate change has made the United Kingdom's record-breaking 2018 summer heatwave around 30 times more likely than under normal conditions, the country's meteorological body has said. The UK as a whole endured its joint hottest summer on record in 2018, and the hottest ever for England. Temperatures peaked in the east of England, reaching 35.6C (96F) in Felsham, Suffolk on July 27, and the UK's average temperature matched previous highs recorded in 2006, 2003 and 1976. A new analysis from the UK's national weather service, the Met Office, presented at the United Nations' COP24 climate change conference in Katowice, Poland Thursday, has shown that the UK now has an approximately 12% chance of average summer temperatures being as high as in 2018..."
George H.W. Bush Put Environment Above Politics - We Should Too. An Op-Ed at TheHill resonated; here's an excerpt: "The death of George H.W. Bush is cause to honor a man who made it possible for all Americans to breathe cleaner air. It also reminds us that partisan politics need not obstruct progress toward a healthier environment. The historic Clean Air Amendments of 1990 would not have happened without the leadership of the late president Bush. Together with Senate Majority Leader George Mitchell — “the two Georges” — the Bush administration and Congress took on the hard work of crafting legislation to update the Clean Air Act, building on its strengths and repairing weaknesses that had emerged since 1970..."
Poll: Majority of Voters Worried About Climate Change. Politico has a summary of recent polling: "A new poll shows most voters side with elements of the federal government that sounded the alarm last month in a dire report on climate change rather than with the head of that government — and the nation’s leading climate-change denier — President Donald Trump. According to the latest POLITICO/Morning Consult poll, two-thirds of voters say they are very or somewhat concerned about the report. A 58 percent majority agrees with the scientific consensus — and disagrees with Trump — that climate change is being caused by human activity..."
Photo credit: "President Donald Trump's stance on climate change conflicts with the opinion of the majority of American voters, according to a POLITICO/Morning Consult poll." | Peter Dejong/AP Photo. Greenland's Ice Sheet Melting Faster Than Thought - Research. Reuters has details: "Greenland’s ice sheet is melting at a faster rate than previously thought and continued global warming will accelerate thawing and contribute to rising sea levels, scientists said in a paper published on Wednesday...In a paper published in the journal Nature, scientists from the United States, Belgium and the Netherlands analysed melt layers in ice cores in western Greenland to develop a record spanning 350 years. The magnitude of Greenland ice sheet melting is “exceptional” over at least the last 350 years and continued growth of global average temperature will accelerate the melting and contribute to sea level rise, the study said..."
File photo credit: "An iceberg floats in a fjord near the town of Tasiilaq, Greenland, June 18, 2018." REUTERS/Lucas Jackson.